Hundreds of archaeological sites left buried for centuries were revealed this summer thanks to weeks of dry weather early in the season. 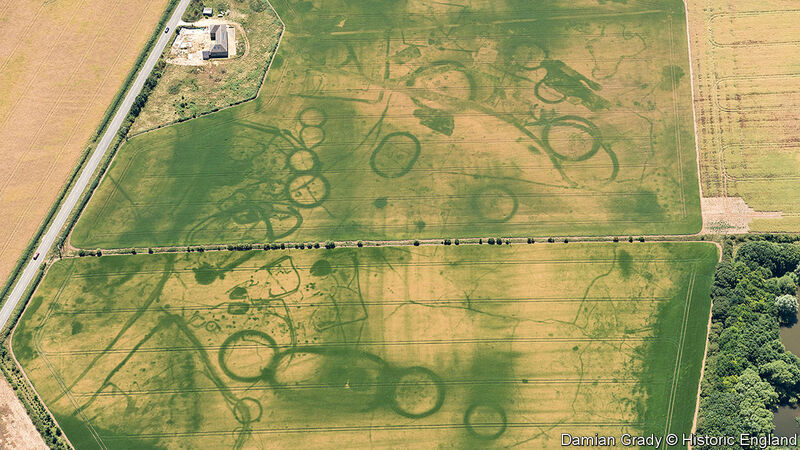 The weather conditions allowed experts to take aerial photos of ‘cropmark sites’. The marks are produced when crops growing over buried features develop at a different rate from those growing next to them. A Roman camp near Bradford Abbas, Dorset, was revealed in June after three sides became visible in rain-parched fields of barley. The lightly-built defensive enclosure would have provided basic protection for Roman soldiers while on manoeuvres in the first century AD and is one of only four discovered in the south west of England, English Heritage said. The dry conditions also allowed well known sites to be photographed in greater detail. Newton Kyme in North Yorkshire, was shown to not only be home to a Roman fort dating back 2,000 years but also a larger, stronger defence built in 290AD. Stone walls up to three metres thick and a ditch 15 metres wide were revealed by an image taken from a Cessna light aircraft. Dave MacLeod, an English Heritage senior investigator based in York, said: ‘It’s hard to remember a better year. ‘Cropmarks are always at their best in dry weather, but the last few summers have been a disappointment. ‘This year we have taken full advantage of the conditions. We try to concentrate on areas that in an average year don’t produce much archaeology. Flights over the Holderness area of the East Riding proved particularly productive with around 60 new sites, mainly prehistoric, found in just one day including livestock and settlement enclosures. English Heritage said some sites which have not been visible since the drought of 1976 reappeared this summer. Damian Grady, a Swindon-based English Heritage senior investigator, said: ‘Promising signs started to emerge in late May when the dry conditions had started to reveal cropmarks on well drained soils, especially river gravels and chalk in the east and south east of England. ‘By June it became clear that the continuing dry conditions would produce good results across most of the country. ‘We then targeted areas that do not always produce cropmarks, such as clay soils, or have seen little reconnaissance in recent years due to recent wet summers or busy airspace.